The victory was the 21st of the 39-year-old Finn’s career and first since the Australian Grand Prix of March 2013, a gap of 113 races dating back to when he was racing for now-defunct Lotus. Red Bull’s Dutch youngster Max Verstappen took a surprise second after starting 18th in a thrilling finale with the top three cars running nose-to-tail and separated by just 2.1 seconds at the chequered flag. Ferrari’s Sebastian Vettel, Hamilton’s only title rival, spun down to 15th on the opening lap but fought back to finish fourth — a result that means the championship remains mathematically open going into Mexico next weekend. Hamilton, on 346 points, has a lead of 70 over his four-times champion rival with a total of 75 remaining to be won from the last three races. That means even if Vettel wins in Mexico, the Briton need finish only seventh to be sure of the title but Sunday was still a missed opportunity for Mercedes, who got their tyre strategy wrong. “I actually thought we would have been able to do better but this is the best we were able to do in the end,” said Hamilton. “We just have to keep working and keep pushing for the next race. 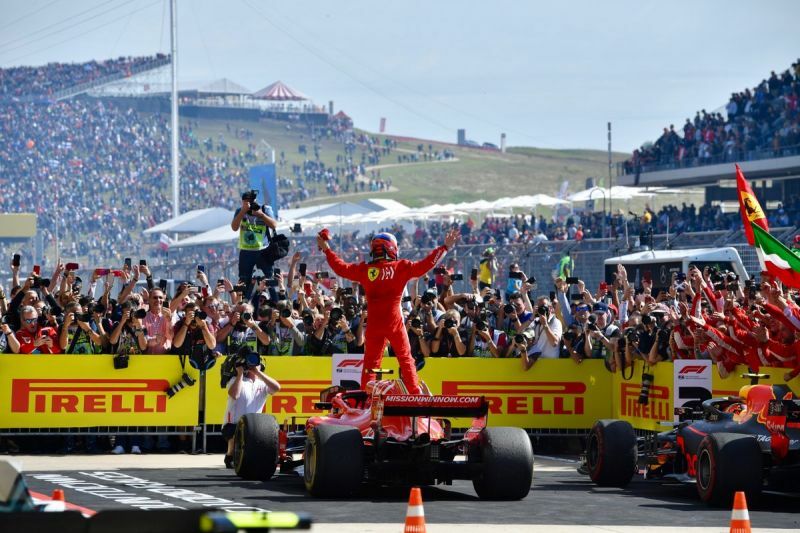 “I’m not really quite sure how the strategy ended up like that,” added the Briton, who had started on pole position but lost the lead to Raikkonen into the first corner at a sunny Circuit of the Americas. Hamilton pitted early during a virtual safety car period but had to make two pitstops to his rivals’ one, losing time on fading tyres before being called in. A late charge over the final 19 laps from fourth was not enough. Team mate Valtteri Bottas helped by letting him through for third, but the Finn then lost out to Vettel as his tyres wore down and finished fifth. Hamilton went wheel-to-wheel with Verstappen with two laps left but failed to make the move stick and ran wide at turn 18 after giving the Dutchman plenty of space. “Did you win the championship?” enquired 2007 world champion Raikkonen, whose last previous win with Ferrari was in 2009, in the cool-down room. The outcome had looked very different at the start, when Vettel, fifth on the grid, spun on the opening lap after making contact with Red Bull’s Daniel Ricciardo in the battle for fourth place. It was the second time in two races that the German had come off worse against a Red Bull — in Japan he had started eighth, dropped to 19th after a collision with Verstappen and fought back to sixth — and he seemed to have handed the title to Hamilton. Instead, he staged a solid recovery drive to delay the inevitable. “I’m happy for Kimi, really. Tough weeks for the team and the tough times don’t seem to be stopping for me. It should have been a better day,” said Vettel. Ricciardo, who is leaving for Renault at the end of the season, made it easier for him by retiring with a power unit failure after eight laps while in fourth place. “He’s taken out his frustration in his room by putting his fist through the wall, which you can totally relate to,” team boss Christian Horner told reporters later. Renault’s Nico Hulkenberg finished sixth, ahead of Spanish team mate Carlos Sainz, with Force India’s Esteban Ocon eighth before being disqualified for a fuel breach. So too was Kevin Magnussen, ninth across the line for the U.S.-owned Haas team. Their removal from the results lifted Force India’s Mexican Sergio Perez to eighth, with Toro Rosso’s Brendon Hartley ninth and Sauber’s Marcus Ericsson 10th. McLaren’s Fernando Alonso retired after an opening lap collision with Williams’ Lance Stroll, who was handed a drive-through penalty. “I drive in another series with amateur drivers, theoretically, and there has never been a problem,” said the angry Spaniard, who also races in the World Endurance Championship.